As the caster of the semi-automatic packing machine was broken, I purchased it. Thank you for the perfect size and smooth movement. Ishijima Trading Co., Ltd. This review is about item#2543773. Since the lathes are used within the range of hobbies, the use environment was not so good, so we made a table with casters. Although it moves to the place where sweeping can be done easily when using it, there is feeling that it gets over softly even against the ground with some level difference and it feels good. This review is about item#2542802. Surprisingly because the width of the wheel is wide, I think that it is hard to wear and it has durability. It is thicker and more secure than those of mass retailers. This review is about item#02543125. This review is about item#02543274. Modified to be able to move the conveyor used in production. It is smooth and can be used without problems. This review is about item#02542793. Because the workbench itself was heavy, I bought it for moving the workbench, but I was able to move alone, it made it possible to use a narrow space effectively and it was very helpful. Even if the caster is sideways, I think that it is very good because it will turn smoothly when moving. This review is about item#02543764. I am using it as a caster of a hobby's racing cart carrier, but it is very good for running performance. The ordinary hobby of the racing cart carrier caster is φ60 or 75, which is φ100. If the mounting screw is φ100, other companies' products can not be mounted with M16 or M16 equivalent screws, but this can be used with M12 equivalent inch. It is user-friendly enough that you can ask where you bought from a number of other Carter people. The price is equivalent to φ75 and reasonable. I regret that I should purchase it and replace it earlier. To screw into the frame, the nut is thin and can not be tightened because the spanner is not hooked. 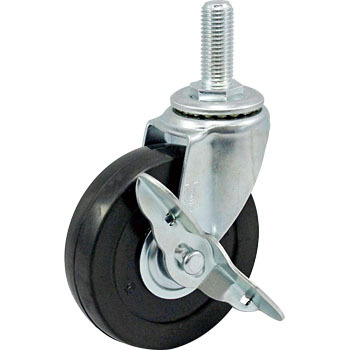 At least, if something is done on the head of the screw it can be shipped with casters that are not tightened, so you can not ship it I replaced it. It is a product with excellent cost performance.